Helping your prospects find you. There are three main stages of the Buyer’s Journey: Awareness, Consideration, and Decision. Why focus on the “Awareness” stage? 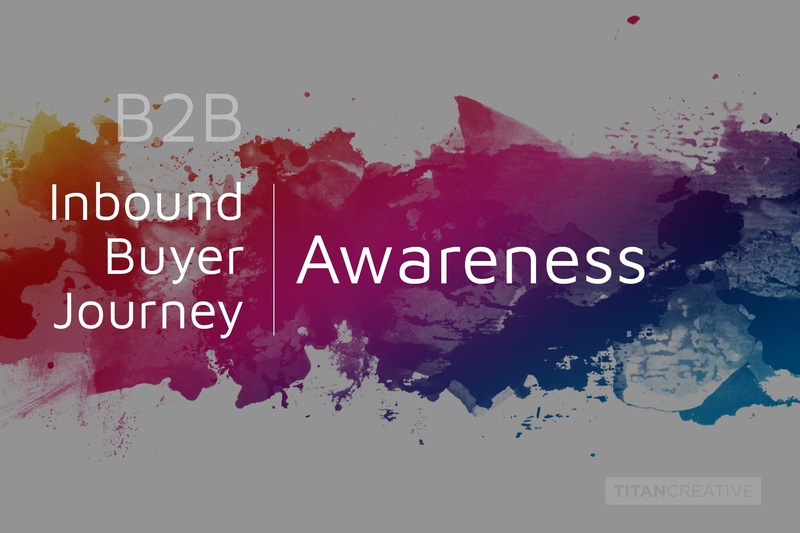 In Inbound marketing, the Awareness stage represents the earliest part of the Buyer’s Journey, and is also commonly known as the top of the marketing funnel. The fundamental principle of Inbound marketing is that you provide your prospects with authentic, upfront value that will help build loyalty, trust and affinity. At this stage, your prospect is actively engaged in exploring content and information that seems relevant to their area of business focus or responsibility, but they may not yet have yet fully articulated or defined a specific problem or opportunity. They are likely not even considering a particular vendor to work with at this point. They might be engaging in casual research, searching Google or following social media channels. At this stage of the funnel, developing engaging content is essential in attracting potential new customers to your website. What kind of content should you produce? Content at this stage should provide genuine value to the reader, and while the ultimate goal should be to move them along the Buyer’s Journey — towards the Consideration stage – the inital goal is to simply to bring new prospects into your content ecosystem. In essence, to convert strangers to visitors. Your organization should be producing detailed, relevant content that reflects the interests of your prospect – which would have been identified when you created your Buyer Personas. It should identify the problems your prospect may be facing, help them to define them, and offer helpful information. At this stage, cast a wider net. Perhaps you are selling a technology solution. You may pull a prospect to your site with general content that relates to industry trends, new and interesting technology, or through work-lifestyle posts that would resonate with people in particular roles, with particular areas of responsibility. How long should the content be? Long-form content is most likely to rank highly in Google, but for very specific niche problems, shorter posts are okay too. Most of the articles that end up on Page 1 of Google are more than 2,000 words in length - the search engine rewards detailed content because they want to help people find the answers they’re looking for. It’s difficult to provide truly amazing content in 300-400 words because that’s just not enough space to identify and solve a problem or codify an opportunity. Remember, this is not about creating high-quantity fluff to host related keywords. This is about offering interesting, topical content that will resonate with your prospects and bring them towards you. How will my audience find the content? As you produce more content, you'll increase your organic SEO equity (helping more people naturally discover you through search) while offering more to keep your visitors engaged and interested. With a strong content strategy in place, complemented by on-page SEO and social media promotion, your prospects should easily be able to find you at this early stage of the process. You can play around with the format of your posts and see what your audience responds to the most. This may include ‘How To’ articles, lists and explainer posts. There has also been a huge trend toward audio and video over the last few years, so consider what channels you’re using — podcasts or vlogs could be a good option for your organization, social videos can help promote blog posts, and they don’t have to break your budget. If your organization is ready to make the leap into inbound marketing but you’re not sure how to get started, or you know you need to get started but you don’t have the budget to hire a team, consider outsourcing this aspect of your marketing strategy. Up next: The Buyer Journey | Consideration Stage. Titan Creative Inc. is a creative and digital Agency helping clients across North America drive results. Mark Glucki is Head of Content Strategy at Titan Creative Advertising and Communications Inc.